history account set against the uniquely rich social and historical landscape of north-east Wales. KEITH NURSE on the latest thinking about OFFA'S and WAT'S DYKES, first published in New Welsh Review 52. 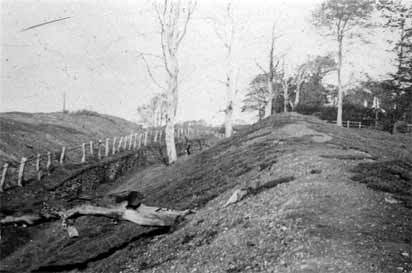 "A demarcation line deepy impressed upon the soul of Wales": Offa's Dyke near a former colliery site at Ruabon. The one did take the other prisoner streight. A famous thing, indeed, Offa'sDyke - and 'farre in length'. But endlessly puzzling, too. Not surprising, then, that it has attracted a host ot often contradictory descriptions: an imposed racial border, the Hadrian's Wall of Welsh experience, a patrolled frontier line, the largest archaeological monument in Britain, the most impressive early medieval structure of its kind in Europe, a symbolic frontier and 'boundary line ofCymru', a public manifesto rather than a military work, an act of war not peace, a boundary defined by treaty, one that marked out an age-old division between the men of the hills and the men of the lowlands. Writers and historians alike have always been unsure quite what to make of the ancient earthwork that stretches through the borderlands. An all-things-to-all men monument - to triumph or failure, or maybe neither. On one level, it is a demarcation line deeply impressed upon the soul of Wales; on quite another, an early and perhaps not unwelcome acknowledgement of the separateness of Wales. There is no doubt about the standing of the man behind it all, Offa, the Mercian monarch and contemporary of Charlemagne. Offa may have been accorded international recognition as 'King of the English', but the historical narrative of his reign (757-796) is at best fragmentary. Most of the surviving manuscripts probably went up in Viking smoke. Wrexham 1844: some 1,200 years after it was built Wat's Dyke still clearly marked the town's western boundary. It is said he breathed his last at Rhuddlan and that his successor, Coenwulf, was killed at Basingwerk (Dinas Basing), near Holywell, on the Dee Estuary in 821. The presence of the frontier dykes was firmly fixed upon the imagination of the early Welsh poets. Yet their powerful if oblique references only add to the confusion. But the political context that they touched upon is all-important - the uneasy, shifting alliances that developed between the Welsh and the 'Saeson' in the sixth and seventh centuries. If they reflected arrangements founded upon military and defensive needs, we can be sure, too, that these cross-border deals were often volatile and stormy affairs. It was Asser, the 9th-century Welsh bishop of Sherborne and biographer of King Alfred, who first declared that Offa was the mastermind behind the building of the great rampart-and-ditch earthwork. In his life of King Alfred, written within a 100 years of Offa's death (an account that, oddly, seems to have been addressed to a Welsh audience) Asser called it 'magnum vallum'. It was certainly that, in places incorporating a 25ft- high bank above a 6ft-deep ditch and controlling maybe 150 miles of the borderland-frontier, though the extent of the line surviving and traced is about 80 miles. Asser's claim, however, that it extended from 'sea-to-sea' is unproven. It has been suggested recently that the reference meant 'river to river', perhaps the Ciwyd, or the Dee Estuary, to the Wye. Yet it is surely worth recalling these days, with the emergence of the National Assembly and, arguably, a new sense of Welsh political consciousness, that the dyke was also, by implication, an Anglo-Saxon admission of failure to extend their power to Wales. That sort of walling-in strategy has had a long and dishonourable history: what you can't subjugate safely, you simply draw a line against. Wales was thereby defined by Offa more than 1,200 years ago, creating a border relentlessly gnawed at in the succeeding centuries. Emyr Humphreys in his The Tnlicsin Tradition -A Quest for Welsh Identity has argued that the building of the dyke was a political and psychological calamity, one whereby the sea- and dyke-edged, mountainous peninsula that is Wales took on the character of a fortress. But this embattled state also gave rise to an 'intense awareness of its own identity and cultural responsibilities', thereby creating indirect advantages from being so aggressively boxed in by nature and the English. For that double whammy, you deserve the sympathy vote, if not your own national political forum. In north-east Wales, the dyke's jigsaw world of verifiable history, garbled tales and dark Celtic imaginings is incomplete without considering that other border barrier, Wat's Dyke, parallel near-neighbour of the Offan boundary line. With breaks for natural defensive features - lush tree-covered gorges and ravines stretch like deep probing dark green fingers into the lowland terrain to the east-this other frontier line snakes for some 40 miles through the borderlands, from the river Morda at Maesbrook, Shropshire, to Basingwerk and site of the ruins of the 13th-century Cistercian abbey, on Deeside. The first reference to the existence of the dyke as a distinct structure occurred in Churchyard's 16th-century poem. And his account echoes the tradition that a 'no-man's land' lay between the two earthworks. Wat's frontier has long been a subject of debate, but the academic consensus used to be that it was associated with the same eighth-century strategy that lay behind the building of Offa's great earthwork, even though boundary lines such as these are notoriously difficult to date. If the two linear earthworks, running not much more than three miles apart, both belong to the eighth century, why were they sited so close to each other? Was Wat's Dyke the earlier of the two, or was it a later reinforcement line in those areas where pressure from the Welsh was especially strong? Or was Offa's Dyke, at points trailing magnificently but sometimes indefensibly in mountainous terrain more than 1,000 feet above sea level, an overambitious attempt to overawe the Welsh princes and keep their hostile cattle-raiding followers back where they were deemed ' to belong -on the damp and inhospitable moorlands to the west? At last, we may have a plausible answer. Newly published research suggests that Wat's Dyke is much older than previously thought, and the background infinitely more complex and ambiguous than once imagined-all rather typically and comfortingly Welsh, you may say. It is also, perversely, reassuring to find that nothing quite fits into place: that your history possesses yet another dimension, touching at once upon the unreal, the imagined, yet still drawing deeply on roots embedded in a long-contested soil. The new evidence has come from an unlikely setting - the site of an industrial estate just south of Oswestry, on the Shropshire side of the border, where developers were constructing a freezer store for a firm of haulage and cold storage contractors. That they were doing so on the line of Wat's boundary known locally as Maes-y-Clawdd (field of the dyke) seems even more of an intrusion upon the imagination. Shropshire County Council archaeologists here uncovered the remains of a hearth or fire on the old ground-surface beneath the raised bank of the ancient dyke. Carbon dating analysis of the burnt charcoal and burnt clay remains points to the construction of the earthwork at around 446. In other words, Wat's Dyke, so long thought of as a mid-700s near-contemporary of Offa's Dyke, was probably built up to some 300 years earlier. So, runs the new argument, the people who constructed Wat's Dyke were not the eighth-century Mercians of Offa's day but, rather, the men of the post-Roman kingdom of the northern Cornovii. Put another way, this ancient Maginot line was constructed by a breakaway group of Brits - Welsh chieftains, jostling warlords, call them what you wilt - to mark out their territory against dynastic rivals. Wat's Dyke, near Offa Terrace, Wrexham: "evidence of a good, old-fashioned, ruling family split over long-disputed border territory?" New questions now arise from all this. Is old Wat's earthwork then evidence of a good old-fashioned ruling family split over long-disputed, border territory? The tensions and land-rivalries between the men of the uplands and those of the lowlands doubtless reached back into prehistoric times. The key centre, it is now suggested, was Wroxeter (Viroconium Cornoviorum), four miles south of present-day Shrewsbury. This was the rampart-and-ditch defended civitas capital of the Cornovii tribal grouping and the fourth largest urban centre in Roman Britain. Overlooking the Severn flood plain, it boasted all the trappings of the Roman good life: basilica, baths, temples, a colonnaded forum dedicated to the Emperor Hadrian and much else. There can surely be no better location (other than perhaps the evocative former Roman centres of Caerleon or Caerwent in south Wales) to imagine you are touching the intangibles of early Welsh history. (It is unwise nowadays to used the term Dark Ages, even if you preface it with a cautionary 'so-called,' or, more heretically, cloud it with that most dubious of labels - 'Arthurian'. But in truth, this period is still only observable indistinctly, in a half-light.) You immediately sense there, in the quiet Shropshire landscape, close to a bend in the smooth-running waters of the Severn, that the old Roman town lies uneasily alone with its past. To the west, the Welsh hills loom threateningly - timeless shadows on a distant horizon. What is known as the 'Old Work' - part of the 25ft-high south wall of the ancient baths-basilica - still stands above the stone-robbed city centre, an isolated sentinel to lost times and forgotten men. Yet even in its decaying form, the city was a triumph of sorts. Freed from the ever increasing tax burden of the late Roman state, its citizens got on determinedly with the business of survival and adapting to reduced circumstances. Their refurbished city ultimately outlasted the Western Roman Empire by some 150 years. 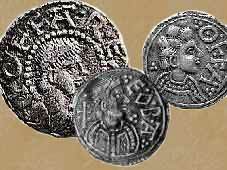 Coins of the realm of Mercia: depicting Offa and Cynethryth, his wife. The annals don't tell us that, but archaeology does. A long and extraordinary programme of pioneering excavations has produced evidence of a structured and ordered society flourishing long after the formal withdrawal of the Roman administration and legions in 410. By the end of the 5th century, Wroxeter had undergone a dramatic change. The civic centre had been reorganised with a range of buildings assembled on classical lines and to Roman measurements. But the new purpose- built structures were of timber rather than stone. The most original work occurred in the final phase, between 530 and 570. The buildings at the heart of this revival included a 120x50ft timber-framed residence for a man of substance. Someone was clearly lording the old city precincts - and beyond. A turbulent world, this, of saints and sinners, British warrior-kings, and blood-brother conflicts between quarrelsome cut-throats: small men who cast long shadows across a dark age. The era, in short, of the 'tyranii' so fiercely denounced by the British monk Gildas in that most splenetic of tracts, De Excidio Brittannae, written circa 540. Gildas is believed to have lived at one point at the monastic settlement at Bangor-is-y-Coed (Bangor-on-Dee), located half-way between Wroxeter and Chester. The site, on the banks of the River Dee, lies no more than a couple of miles west of the line of Wat's Dyke as it runs northwards in the direction of the Wrexham area. The earliest and most influential of all English historians, the Northumbrian Venerable Bede went out of his way to recount the fact that hundreds of monks from the riverside settlement were killed at the instigation of the Northumbrian King Aethelfrith, at the Battle of Chester circa 616. Bede was torn between his faith and nationalism and, like the good English Christian that he was, patriotism and his fiercely anti-Celtic Church stance consumed him. The slaughter was just retribution, in his view, for the rejection by the Welsh Celtic Church leaders of St Augustine's bid for overlordship of the Church in Britain. In this battle, at the former city of the 20th Roman legion, the Northumbrians soundly defeated a combined force drawn from Gwynedd, Powys and, we are told, the lowland Cornovii. This bloody conflict ushered in a long sequence of wars involving alliances between the Welsh kingdoms of Gwynedd and Powys, under Cadwallon and Cynddylan, and Anglo-Saxon Mercia, led by the indomitable pagan warrior-king, Penda (reigned 633-655), a monarch who seems to bear a British name, but who stuck rigidly to his ancestral gods. It is in this context, it is suggested, that the eastern lands of Powys and the power base at Wroxeter were peacefully ceded to Mercia. According to some sources, the hand-over may have been the price paid by the weaker partner of a protective alliance arrangement against the formidable Northumbrian foe. This scenario is consistent with the archaeological evidence for the unhurried and ordered end of organised life of post-Roman in the ancient civic centre. It also gains further credibility following the dating of the new finds at Oswestry. This would suggest that the lands of eastern Powys were already territorially marked out, thus facilitating their ultimate absorption into the burgeoning Mercian kingdom. At Frogmore, Atcham, near Wroxeter, aerial photography has picked out crop marks of a range of Anglo-Saxon timber halls. They are unique in Shropshire, and are strikingly similar to those excavated at the major seventh-century site at Yeavering, in Northumberland, the most famous royal ceremonial centre in the North of England in the sixth century. Militant and expansionist Northumbria was clearly exercising a powerful influence in the 7th century. But there seems to have been a good degree of continuity within the kingdom, from the British to Anglian control, and these influences may have left their mark in the Welsh borderland region. The church on the bank of the Severn at Atcham, which is mostly built of re-used stone from the ruins of the nearby Wroxeter Roman city, bears a unique dedication - to St Eata, a Northumbrian monk who died in 685. Further mysteries abound in this murky period of history. According to Bede, the original name for the centre at Yeavering was Ad-Gefryn -hill of the goats in Welsh. It was here, significantly enough, that archaeologists discovered a rare burial of a pagan priest, with a stylised goat- decorated metal staff and a goat's skull - maybe an example of the exclusive badge of office. This, it was argued recently, is evidence of taboo activity known to be deeply offensive to the early Christian church - the Anglo-Saxon veneration of goats that, in turn, gave rise to the portrayal of the anti-Christ as a goat-like figure with hooves and horns. It may bejust a coincidence, this, but in the 19th century a field-name lying close to the line of Wat's Dyke at Wrexharn (where most of the field-names were then Welsh) survived as Talar y geifr, interpreted as 'goat's headland'. Ancient boundary dykes were often given fanciful names, many of them associated with the 'devil'. The relevant references at Wrexham were made more than 100 years ago by one of the most gifted local historians to focus on Welsh history, the Norfolk- born Alfred Neobard Palmer. In this area, where the dyke forms the western limits of the borough, he noted the existence of Cae'rswynwr ('wizard's field'). At nearby Acton (a place known in Welsh as Gwaun y terfyn ('the boundary moor') he came across an early field name. Cue Wad ('Wad's field'), just a quarter of a mile to the east of the earthwork. Palmer considered this to be related to the Welsh name for the linear earthwork Clauwdd Wade or Clawdd Wad - the former name being recorded in that form in the 15th century. It clearly incorporating a well-attested personal name, but just who was old Wada? We shall probably never know. 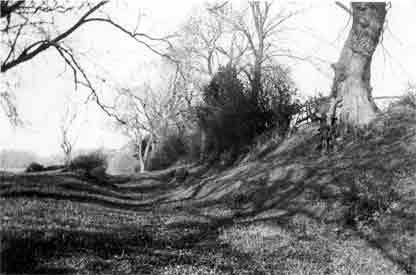 At Wynnstay Hall park estate, Ruabon (seat of the Watkins Williams Wyn family and previously known as Watstay), Palmer also encountered the folk-tale that the dyke was constructed by the devil and that a plea for a 'stay' accounted for the gap in the earthwork at this point. Myth and legend make dangerous tools for the historian, but in Wales, history and legend have long mingled fruitfully and in doing so have enriched the historic background. There can be no fanciful meanderings, though, for the archaeologist, the man with his trowel cautiously inching his way through the debris of the past with all the deliberation of a keep-all-options-open forensic investigator. At the Oswestry site of the dyke site, the evidence points strongly to a 5th-century construction, but it is also important to note that the new date indicated for the building of the boundary would also coincide with the earliest date for the annexation of western Powys by Penda, an ally of the Welsh. Penda it was who created Mercia and brought political coherence to middle England, and it is likely that his power was based in part on is peaceable relations with his British neighbours in Wales. This would fit in with the broad context of the tales recounted in the early Welsh poem cycles, with their evocative references to the loss of a kingdom and to recognisable sites in the area of the Shropshire border and Wroxeter region. However, contrary to the underlying theme conveyed by the bards, the lands to the east of the Severn donot seem to have been lost to Mercia as a result of bloody conquest. The context for these Welsh tales, it transpires, lay not in the seventh century - where they were set - but in the ninth century, when the passed-on oral traditions, delivered with such lyrical passion in the mead-filled halls of the Welsh princes, were finally set down on vellum. The distinguished Welsh scholar Sir lfor Williams has pointed outthat they were Powys-produced saga tales, not strict history. They were declaimed, not in times of triumph, but rather (according to the linguistic evidence) in the mid-800s, during a period of acute Welsh depression and despair, when there was no hope of ever winning back the Shropshire marches. The genius of the Welsh is surely to forge, amidst the depths of despair, an art form of supreme and haunting grandeur, and somehow turn defeat into a celebration of spiritual triumph. They had little to sing about, but that didn't matter. Their fortunes had changed dramatically, and for the beleaguered ninth-century Powysian chiefs, engaged in a heady bouts of minstrel-inspired Celtic ancestor worship, the atmosphere was deeply threatening. The old 'Saeson' foe - now led by the invincible Offa - was pressing hard and aggressively west. The background scenes in the poems of Llywarch Hen shift confusingly from the Rheged district of South Scotland and Cumberland, to Powys, and here the sagas, with the famous 'The hall of Cynddylan is dark tonight' lament have left deep-reaching-back, name-places, on both sides of the border. Gwen by the Llawen kept watch last night. Sad is the tale, on Gorlas Dyke . . .
My son was a man, stubborn in conflict. At the Ford of Morlas, Gwen fell. The linking of topographical evidence to historical figures and events is a risky business. Nevertheless, the accumulation of such evidence is both compelling and highly suggestive. Basingwerk, where Wat's Dyke is known to end, may be an even more crucial location. In his seminal survey-study of the dykes, the distinguished scholar Sir Cyril Fox drew on the evidence of the noted 18th-century Flintshire-born Welsh antiquary Thomas Pennant. According to Pennant, the Deeside monastery site name had been compounded with the personal name Bassa - meaning the 'fort of the people of Bassa'. Intriguingly, in the early Llywarch Hen collection, there is a reference to Baschurch (Eglwysseau Bassa, in Welsh) in the western half of Shropshire, a site near the post-Roman base at Wroxeter. Baschurch has been identified by some as the burial place of the seventh-century Powysian prince Cynddylan, and the nearby ancient earthwork, The Berth, as the site of his hall, Pengwern. This disputed background acquires an even greater significance, given the new dating evidence discovered on Wat's Dyke at Oswestry. It is worth noting at this point that the market town of Oswestry, nestling in the Welsh foothills above the Shropshire plain, has long been an important cross-border location. Its magnificent Iron Age fort (Yr Hen Dinas, known locally as Old Oswestry and linked by Welsh folklore with Arthurian legends) was incorporated within the line of Wat's boundary. It was firmly in Marcher lordship territory in medieval times, not becoming part of Shropshire until 1536, when Henry Vlll's officials set out the border of the Tudor monarch's new Wales, as elsewhere, without reference to Welsh-language culture or history. Brothers who grew like hazel saplings. All are gone, one by one. . . Endure, they did, these dykes, and so did the richly dramatic tales of the early Welsh storytellers. Offa's Dyke went on to become a major frontier symbol, while its neighbouring parish and township-defining neighbour, Wat's Dyke, forged its way, silently, into the records as the formal boundary of north-west Mercia, its importance as the western limit of the region lasting until the Norman Conquest. The two centuries following the death of Offa in 795 are almost as historically confusing as all that went before, with both Welsh and English annals speaking of truces, retreats and raids (most of them English). Yet in what until recently was east Denbighshire, the Anglicizing of the settlements up to Offa's Dyke appears to have been reversed. The significance of this was recognised by the Wrexham historian Palmer. According to his version of events (based, it should be said, on scrupulously assembled personal and place-name evidence), the Welsh swarmed east across the Dyke in the 11th century. And they did so in such numbers that some 15 miles of the border lands in present-day Cheshire and Shropshire became 'wholly or partly Cymricised'. He told the Honourable Society of Cymmrodorion in 1891: 'By the gradual Anglicizing of these intruders - a process which has taken 800 years to effect - Offa's Dyke has now again become, roughly speaking, the border line between those who speak English and those who speak Welsh. This was but one phase in a long story of resistance and cultural resilience; a little-noted sequence in the tantalisingly elusive story of early Wales, embalmed, as it always has been, by that curious triad of Welsh indulgence: literature, legend, and half-remembered history. It makes for a devilishly confused saga, but then it's no more than you might expect, in the circumstances. The Taliesin Traiiitioil - A Quest for the Welsh Identity, Emyr Humphreys, Black Raven Press, 1983. Archaeological Investigation on Wat's Dyke atMaes-y-Clawdd, Oswestry, H. R. Hannaford, Archaeology Service, Shropshire County Council, December 1999. The excavation produced some residual deposits of worn sherds of Roman Samian ware and courseware pottery. The report suggests that the dyke should be 'regarded as being contemporary with the other great 5th century linear earthwork, the Wansdyke in Wiltshire . . . an achievement of the post-Roman kingdom of the northern Cornovii, rather than a work of 7th-8th century Mercia.' Dr David Hill, Senior Research Fellow, Centre for Angio-Saxon Studies, University of Manchester ('Offa VersusThe Welsh' - British Archaeoiogy, December 2000) has argued for a date later than the 6th century for Wat's Dyke - that it was constructed as Gwynedd and North Powys briefly became a unified state. Evidence from both dykes suggests, he says, that people were not settling or spending much time in these 'wild zones'. Wroxeter: Life and Death of a Roman City, Roger White & Philip Barker, Tempus Publishing, 1998. 'Timber Halls at Frogmore, Atcham' and 'StEata's Church, Atcham' in Shropshire From the Air - Man and The Landscape, Michael Watson and Chris Musson, Shropshire Books, Publishing Division of the Leisure Services Department, Shropshire County Council, 1993, reprinted 1994. 'Tolerating Pagans For the Sake of Trade', Paul Blinkhorn in British Archaeology, No. 44, May 1999. A History of the Town ofWrexham A.N. Palmer, 1893. Republished, Bridge Books, Wrexham, 1997, pp. 103/104. 'The Poems of Llywarch Hen' in The Beginnings of Welsh Poetry - Studies by Sir Ifor Williams, edited by Rachel Bromwich, University of Wales Press, Cardiff, 1972; 1990. Offa's Dyke: A Field Survey of the Western Frontier-works of Mercia in the Seventh and Eighth centuries. Sir Cyril Fox, published for The British Academy by Oxford University Press, 1955. 'British Collapse' in The Age of Arthur: A History of the British isles from 350 to 650, John Morris, Phoenix Giant Paperback, 1973, reissued 1998, pp. 244-245. 'Offa's and Wat's Dykes/Welsh Settlement East of Offa's Dyke During the Eleventh Century' in The History of The Parish of Ruabon and The Town, Fields, and Folk of Wrexham in the Time of James the First etc., A.N. Palmer (1847-1915), Bridge Books, Wrexham, 1992. Recent discoveries at Plas Coch, Wrexham (Archaeology in Wales, Vol. 37, 1997, pp. 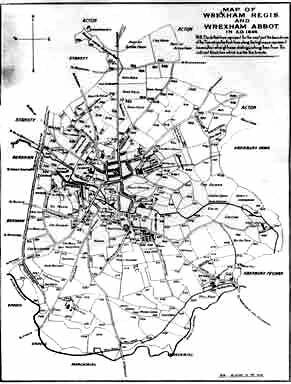 79-80) have established that the area - 12 miles distant from the major legionary base at Chester, Deva - was not, contrary to earlier opinion, a 'blank' in the Romano-British period. A prosperous 2nd-to-3rd/ 4th century farming settlement with maybe a semi-official administrative function, it lay a short distance to the west of the line of what later became Wat's Dyke. 'A famous thing ... that reacheth farre in lenght' is copyright �2001 Keith Nurse. Used with permission.